This was the other Cricinfo article of ours to be published yesterday. Apparently we were to be found at both ends of the cricket writing spectrum on the 4th of September, 2014. This particular article’s that old staple, the fictional meeting between captain and coach. The bit we’re most proud of is the final sentence. Our latest Shire Horse column for All Out Cricket is quite Bears-centric, which will satisfy as many as one of this website’s readers. Yorkshire get a mention too. Plus there’s some other stuff. Let’s end how things always end – with some bad news. At the start of the season, we suggested that you watch out for Lancashire’s Kyle Hogg. Unfortunately, this has meant watching him retire from cricket early due to chronic back knack. For one reason or another, he’s never seemed to manage a long run in Lancashire’s first team and we thought this was about to change but sadly his body felt otherwise. A Joe Root 113-from-108 isn’t bad. That dot ball was higher because England were still, technically, in with of a chance of winning the series back then. 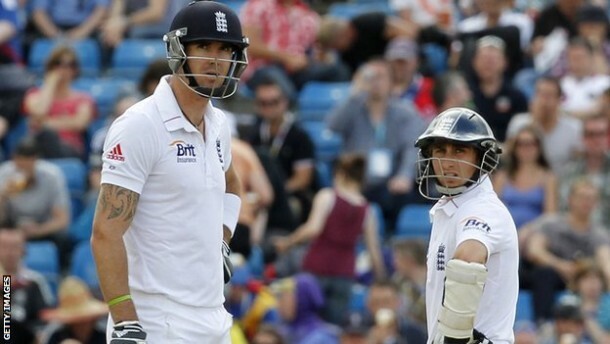 Jokes about talking down to James Taylor? In no way was that intended, but at the same time let us be clear that we are in no way averse to the most shameless sizeism from time to time. They have done it, though. They have up-skilled considerably, despite the fact that they were 39 for 2. The thing is, they were 39 for 2 after 6 overs, instead of 39 for 2 after 12 overs (2nd ODI), 39 for 0 after 8 overs (3rd ODI), and 39 for 3 after 15 overs (4th ODI). All England needs to do is understand that 39 for 2 after 6 overs is BETTER than all the others, even than the 39 for 0 after 8 one. None of this gets them off the hook, of course, because actually they haven’t up-skilled at all. What they’ve done is up-thought-about-it. And the captain and coach whose job it is to up-think really ought to have been able to think at that level from the start, instead of only after a million words of criticism in all the papers. They have still shown no evidence whatsoever that they are capable of intuitive thinking about ODIs, or even about test matches frankly. Cook portrays his stubborn single-mindedness as a virtue. It is not. It is a major failing, perhaps the single worst possible failing, of an international captain who is faced with variation of pitch, conditions and opponents ahead of every single match. There is no one-size-fits-all tactic in cricket (unless your attack is Holding, Marshall, Garner and Croft). To be fair, Marshall was a different size. A right short-arse by West Indian fast bowling standards. Unfortunately I’m otherwise engaged on the day of the Lord’s final. Don’t you just hate it when your team is too darn successful for your social life? Ooh, well done. Which of your teams is playing? Is it the Stetchford Retail Park For All Your Shopping Needs Bears? They’re my ninth favourite Cricket Birmingham PLC sports franchise. Maybe we should call on an ageing, washed-up former England great to come back and not quite win us a trophy. Is Dermot Reeve available, or is he still busy selling ‘Don Bradman’ autographs? Dermot Reeve is still busy being a hero in 1994. After that he disappeared and nobody knows or cares why. Asif Din is probably available. How about Paul Smith? Uh-oh, I’m afraid we’ve got another use of “Moeenalitharan” in the Cricinfo live commentary. Although it has in fact been spelled “MOOENALITHARAN”. Does Moo-een Ali produce Jos Butter or Alex Pails of milk? More worrying, in a world of Cooksey and Mooresy, is finding an appropriate nickname for Mooen Ali. “Alisey” doesn’t really work. Even if we go the Aggers/Tredders route, we’re stuck with “Aliers”, which is rank. We’ll have to drop him – clearly he is no good for England if we can’t give him a predictable nickname. I just heard an English (referring to nationality, not language) commentator mention, “If Alex Hales fires, England can get close to 300”. That, to my mind, encapsulates what is wrong with England’s one day approach. They still think of “pinch hitters” at the top of the order while other limited over teams definitely have more than one batsmen capable of scoring at pace to get the team past 300. Like KC pointed out, a lot of this has to do doing the wrong things in the middle overs and wanting Hales to hit out at the top of the order is symptomatic of just that! In other mop up news, I love this headline – Varun Aaron joins Durham – if you say it out loud in an MCC accent, especially after a couple of G&Ts, it’s a hat-trick rhymer. I don’t think any 1980’s bands managed the triple. Shame he doesn’t arrive in time for next week’s fixture at HQ. But at least my planned presence at that fixture Tuesday means that I might hear one of the MCC gentlemen actually say the triple rhymer out loud. This reminds us of when a friend was applying to Bath University. In amongst all the various bits of documentation was a booklet about the leisure side of things entitled ‘Bath Simpson’ with a picture of a well-known yellow cartoon character on the front. Between the two of us, we spent a good 10 minutes or more trying to work out why they’d used this title. The fact that it took us so long was a way, way better joke than the joke itself. I was bullied at school because I pronounced words like grass and bath and path like a soft southern shandy. And this was growing up in the middle. I wasn’t even being picked on by proper northerners. Is anyone seeing the current Durham-Nottingham match, the one I’m pretty sure that I’m not dreaming? And why isn’t James Taylor in the ODI squad again? Daisy and I have been dipping in and out fo that game – she asked that very same question about James Taylor just a few minutes ago, Balladeer. The simple answer is that he is too small to come from the right sort of family. Also, KP didn’t rate him a few years ago. How could you possibly select someone who wasn’t even rated by a persona non grata player like KP. Has Kyle Hogg got ankylosing spondylitis? With sixty minutes to go before the Not Proper Cricket International stuffs this up, I had the branwave of trying a different browser and the Kingdom was mysteriously restored. Hurrah! I should demand a knighthood at this point for my selfless reconstitution of Your Maj’s Realm but instead I shall humbly take this opportunity to SUBTLY BRAG THAT I JUST WON THE ODI FANTASY MINILEAGUE (just). Congratulations Bailout. Didn’t you top the test thing as well? It is entirely due to your frequent (and obviously brilliant) branwaves that you’re a cereal winner. Sow your oats far and wide – your cricketing acumen demands it. Weren’t our fantasy teams playing this afternoon? I was rather hoping for a late rally, which Messrs Kohli, Darwan and Morgan surely provided for me. In any case, glad to see Laurence Elderbrook’s perennial bringing up of the rear. It’s a comforting feature of life, much like cricket generally in the English summer. I’m afraid I couldn’t wheat for the ODIs because my Test series was hopless. In seriousness, this bizarre server issue has forced me to use my second choice browser (don’t know its name but it comes on Android phones) in which text entry presents a greater challenge than usual. For the Backspace button does not delete the character to the left of the cursor but the character directly above it. As irritating as this trait is, it’s quickly forgotten, and if one is not observant, deletion appears to be entirely ineffective resulting in repeated use of the Backspace key and the disappearance of large chunks of text. More often the odd stray letter vanishes. Occasionally there is comic effect but just as likely is unintelligibility. I wish someone could tell me how to fix it, I suspect it involves something like going to “Settings” then “Obscure” and changing “Deletion direction” to “LEFT, YOU IDIOT” from “ABOVE, BECAUSE THAT’S REALLY CONVENIENT WHEN YOU SPOT A TYPO ONE LINE AFTER YOU COMMITTED IT”. Should I take this opportunity to subtly brag about something? So according to many of the Indian fans on Cricinfo, English fans will now think that T20 is a proper format.